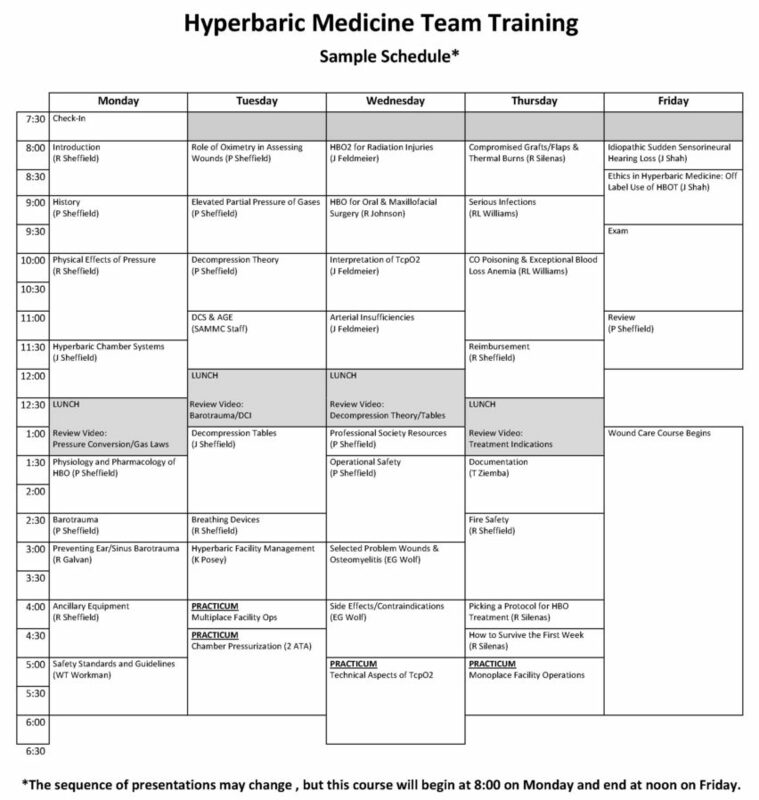 Hyperbaric Medicine Team Training (HMTT) – International ATMO, Inc. This 4 ½ day course is an interprofessional educational activity that provides a team approach to filling a knowledge gap and a first step toward credentialing or certification in this specialized field of medicine. 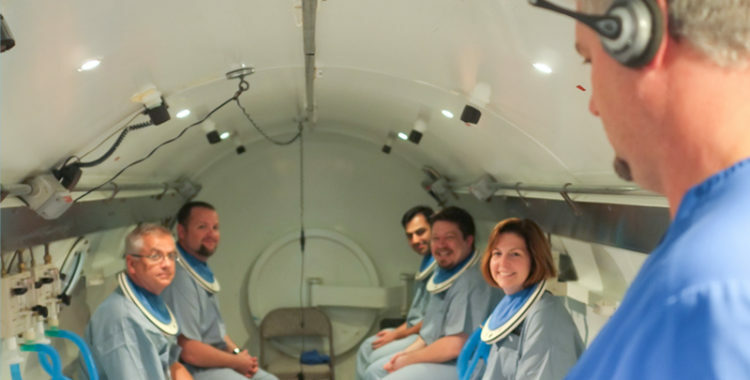 HMTT is approved as an introductory course in hyperbaric medicine by the Undersea & Hyperbaric Medical Society and the National Board of Diving and Hyperbaric Medical Technology. Academics include currently accepted standards for the safe application of hyperbaric oxygen therapy pertaining to both monoplace and multiplace chambers. The comprehensive curriculum is presented by a faculty of experts. 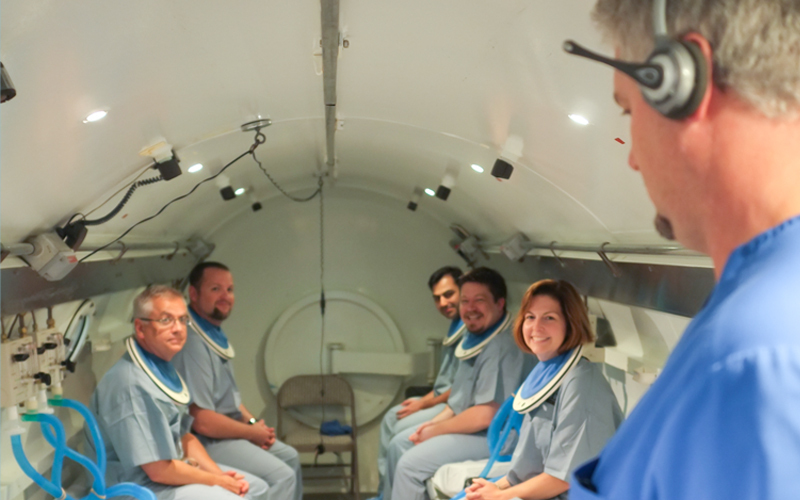 The program offers an opportunity to experience a hyperbaric chamber pressurization. Given the knowledge and strategies provided in this course, physicians should be able to seek hospital credentialing in a hyperbaric medicine department; and, nurses and technologists may start accumulating the necessary clinical hours toward certification. Completion of this course does not constitute certification or credentialing. Physicians, nurses, and other allied health professionals providing patient care in either a multiplace or monoplace clinical hyperbaric medicine department. This course is a prerequisite to becoming a Certified Hyperbaric Technologist or Certified Hyperbaric Nurse, and for physicians seeking hyperbaric medicine credentialing with their hospitals. Upon completion of this activity, participants should be able to demonstrate knowledge acquisition by completing a post-test. Designation Statement: The UHMS designates this live activity for a maximum of 41 AMA PRA Category 1 Credits™. Physicians should claim only credit commensurate with the extent of their participation in the activity. 40 Contact Hours. Provider approved by the California Board of Registered Nursing. Provider Number CEP17094. Departure – The course ends at 12:00 p.m. on Friday. 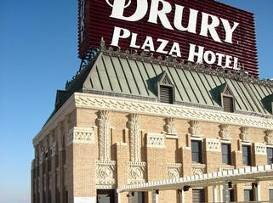 If you plan to leave San Antonio on Friday, you should select a flight that departs after 2:00 p.m.
Start Time – Class will begin daily at 8:00 a.m.
Stop Time – Class will adjourn each day at about 6:00 p.m. On Friday, class adjourns at noon. Participants will have the opportunity to experience a hyperbaric chamber pressurization (dive) in a multiplace hyperbaric chamber. You will be provided scrubs for this activity. Participants are NOT REQUIRED to be pressurized, but all will take part in the activity.